"Your living room looks like a shack"
Over the past few years, we have done a series of renovations to this small house but had not yet done any work on the living room, which happens to be the central space of the house. When our client's granddaughter offered this appraisal of how the living room looked in comparison to the newer spaces it was all the motivation necessary for this latest phase of work. The new stair and balcony railing are designed to be more open, allowing light and views to filter through the spaces, making the spaces feel larger and more connected. The solid landing on the stair, wrapped in walnut, conceals mechanical equipment. Open treads, made of solid walnut, float between a blackened steel panel in the center and the side walls of the stair. 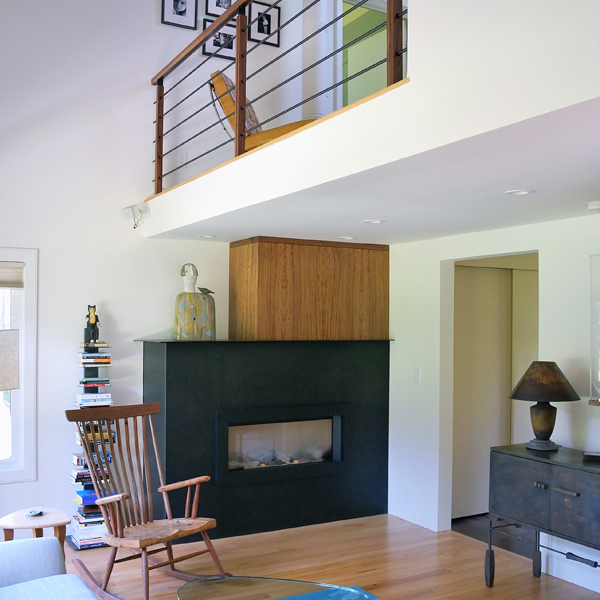 The new fireplace surround is made with blackened steel and walnut, complementing the stair and railing.